I went to drop off a trunk full of items to Goodwill this week and they asked me if I would like a 20% off coupon for the store. I was not planning on going shopping but I could not resist once they gave me the coupon. I thought I would run in real quick before heading home. Well a quick trip turned into over an hour and my trunk filled once again!! But the best part of the trip was finding a old quilt for $2.40!!! The quilt has some very interesting and unique fabric pieces in it. I love the blue borders. The quilt is in fairly good shape. The binding is coming apart a little and I have found one piece of fabric that is damaged. I have a vintage fabric book but I could not find any samples of fabric similiar to what is in this quilt. Here are photos of some of the more interesting fabric pieces in the quilt. Does anyone recognize the age of the fabric? This fabric has different huts or houses throughout it. I have updated my Breast Cancer Awareness pages. Breast Cancer Survivor page and Breast Cancer Memory page My sister lost her dear mother-in-law to breast cancer in October. Madeline was my sister’s best friend. I have dedicated my Breast Cancer Survivor page to Madeline who was a breast cancer survivor for 6 years. Throughout her illness she showed great strength, courage and shared much joy, happiness and sunshine with her family. We are collecting inspirational stories of breast cancer for our pages hoping they will bring comfort to others who may be suffering from this terrible disease. I am always frustrated when I have to hang my large quilts on my quilt racks. I can never seem to fold them just right so they lay properly. 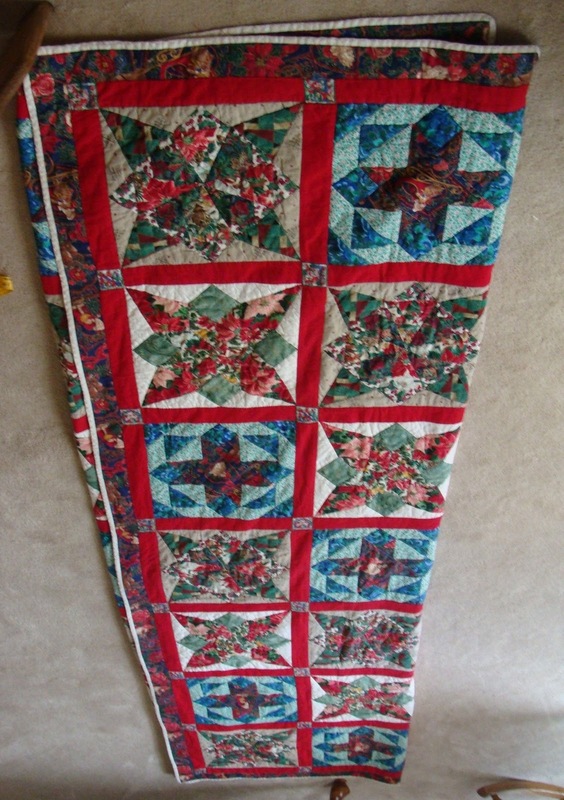 I just took two of my quilts off their quilt racks to hang up my mother-in-law’s two Christmas quilts. This is the first Christmas without my mother-in-law Joy. Sadly she lost her fight with ALS this past March. I have chosen to place her Christmas quilts on the racks this season so my kids can appreciate their beauty instead of them being folded up on the fireplace. Joy and I took our first quilting class together 21 years ago. We spent many hours sharing fabrics, designs and quilting books. We took three hand piecing and quilting classes together. Over the years I have continued doing hand piecing and quilting but have moved to machine work since I have so many projects to complete. Even though Joy was an avid sewer her whole life she only quilted by hand…she never once in 20 years did any of her quilting by machine. Here are the quilts on the rack and some hints on hanging such large quilts on a quilt rack. This how the quilt looked the first time I tried hanging it on the rack….. I was frustrated that it was not hanging nicely. So I took it off and measured my quilt rack across the top which was 28 ½ inches. I decided I wanted 26 inches of the quilt showing on the rack. I then laid the quilt face down on the floor and measured 13” out from each side of the center. Then I neatly folded each side in so it measured 26”. I made sure that it was laying very flat and even. My cat Joey inspected my job. I did make sure that the ends of the quilt at the bottom were very even. I did not pay much attention to the top ends as they would not be showing once the quilt was on the rack. Then this is where it always got tricky for me. In the past as I would lift the quilt up, it would bunch up and look awful on the rack. This time I decided to fold the quilt again so it was half the size. Then I gently picked up the quilt keeping all the layers held tightly together and I laid it over the quilt rack and it stayed neatly folded. Finally the quilt was nice and neat over the rack. The quilt also laid very nicely over the back. Two more beautiful butterflies flew into my mailbox today. Iowa and Illinois came today and they are georgous!! I love the unique shape of the Iowa butterfly and the colorful batik that Diane used. Our Illinois quilt blocks will be up soon so be sure you follow our blog! !